We run flatwater racing training throughout the year. There are three main training groups covering Div 1-3 paddlers, Div 4-7 and Div 8-9 paddlers. If numbers allow, these can be broken down further or combined. A circuit race on the River Thames, normal Hasler distances. A natural beach as well as a pontoon false portage will be used. River traffic to be expected. Hot food and showers are available in club house. Ample free parking in field. The Southampton canoe race takes place on the River Itchen where it runs through Southampton City. The section of river used for the race is where the fresh water meets the estuary at Woodmill Activity Centre, down stream to St Mary’s football stadium. The course travels through contrasting sentry from green tree line areas, parks, marinas and some industrial landscapes. The race starts at Riverside Park with all divisions covering two laps of varying distances to achieve they required divisional race distance. Due to the nature of the river banks in this area there are no portages at this event. The spectating areas are limited but we do have very good view of the start and finish area, with competitor going passed a few times. Good facilities from Bitterne Park Social Club with good parking. The race is a circuit, based on the river Thames alongside Thames Valley Country Park, Reading Race course Div 1–3: 2 loops (varying in length), 19.5 km, 3 portages Div 4–6: 1 loop, 13.0 km, 2 portages Div 7–9: 1 loop, 6.5 km, 0 portages Lightnings/Hody: 1 loop, 2.5 km, 0 portages The river is wide at this point, the current varying depending on weather conditions. Other river users can include other non- motorised crafts as well as motor boats and barges. Shoes and spray decks are desirable but the responsibility of racers. Changing rooms are available and need to be accessed from the rear door of the building. Toilets will be available on the park. The race will be part of the 2018/2019 racing season. 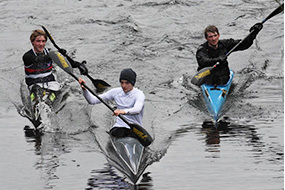 It is run on the River Thames near Marlow and depending on river conditions, is suitable for paddlers of all abilities. It is a ‘standard’ Hasler race with laps of approximately 6 kms. Divisions 1-3 will do 3 laps and 3 beach portages, Divisions 4-6 will do 2 laps and 2 portages and Divisions 7-9 will do 1 lap and no portages. Lightnings and Hody races will consist of a partial lap and no portages. A circuit race on the River Thames between Whitchurch and Mapledurham Locks. Portage is a beach and bank run Suitable for all levels . Race for Divisions 1-10 and Lightning on the River Thames. For Div 1-6 the portage is at Hambleden Lock. The race is suitable for all competitors, advise using spray decks in windy conditions, the Henley reach can become choppy. A typical canal race situated on the Oxford Canal that can be winding andshallow in parts. Suitable for all abilities and ages. Div 1-3. 14 portages. Div 4-6. 6 portages. Div 7-10. 2 portages. Lightnings. No portages. We advise suitable footwear when portaging. Divisions 7 / 8, 9 and 10 portage. Assistance can be offered at the portage for the U13’s. The paddler must hold the front of the boat and the paddle unless it is in the boat. The assister must not put the boat into the water or offer any assistance that will be deemed to be unfair. Note that the water under the motorway bridge 200 yards north of the 1st portage can get a little choppy. Please ensure the rules of the road are followed here. Lower division paddlers please note this. The start will be ½ mile north of the car park starting just past the Hennef Way Bridge and finish at the bridge here at race HQ. Please note that it is important that divisons 1-6 get on the water first. Divisions 7, 8 and 9 must wait until all the higher divisions are on the water to avoid congestion at the pre-starts. There will be pre-start marshals that bring each race up to the start. Please pay attention to their instructions. Please ensure that you are around the start area in good time as it can get congested. Divisions 1-3. Turn 40 yards north of Bridge 147. This has a nice wide turning area. 14 portages in total. Divisions 4-6. Turn just south of Cropedy village. There will be a Canadian canoe or similar marshalling here. Divisions 7-10. Turn just south of Bourton Lock. There will be a marshal on the bank and it is important that the nose of your boat goes past the marshal. Note that this is a very tight turn and our apologies for this. Start list to be given on the day with some divisions split between odds and evens. Directions to race. Follow signs to Castle Quay Shopping Centre car parks and then for Canoe Race. Note: We have exclusive use of the car park area where we hold the event. Please do not park in the Coach Park behind the Garden Centre or on the road as this will incur a parking fine. There is plenty of parking available in the other car parks if the event area is full. We will try to accommodate trailers in the event area and if necessary double park. In addition, there are other less formal sessions for those who just want to enjoy a paddle on the Basingstoke Canal. One takes place at the Canal Centre on Tuesdays from 9.30am in touring kayaks and open canoes; the other takes place on Thursdays at 9.30am at Crookham Wharf. Training Schedule. There is a detailed daily training schedule for the formal training sessions where the programme for each session can be found covering the winter or the summer months. The schedule covers the three main training groups with the highest volume for the Div 1-3 group, less volume for the Div 4-7 group and the least volume for the Div 8-9 group. Our detailed training schedule for 2018 can be found here. We welcome new members with an interest in flat water racing. Three courses are held each year in May, June and July, each comprising of two hour sessions over four consecutive Saturday mornings. Sessions start after training at 11 AM at the Canal Centre, Mytchett. These courses are designed to teach you the skills and techniques applicable to flat water and to develop your confidence in a flat water racing kayak. We currently have no further courses scheduled for 2018. These courses are free to club members and £30 to non-members. The £30 includes the use of the club facilities, boats, paddles and buoyancy aids and Canoe England Third Party insurance. If non-members subsequently join the Club, the course fee is deducted from the initial membership fee. Details for the four sessions on each course can be found here. There will be less talking and more paddling on the first session of each course if the Course Handout is read before the course starts. You should be able to swim at least 50 metres in light clothing should you capsize (and most people do at some time). You will be required to demonstrate this ability in the canal during the course. We provide buoyancy aids, which we require you to wear when on the water during the course. Additionally, all club boats have enough buoyancy to support you. A shower is available in the adjacent Canal Centre. We advise you to shower as soon as possible after each session and before you take any food or drink. Although generally “clean”, the canal has a muddy bottom and, especially after rain, the banks are often muddy. Although extremely rare there are waterborne bacteria (E.g. Leptospirosis) which again make showering after contact with the water or the muddy banks sensible – particularly before eating. We accept children from age 10 on these courses but ideally those under 12 should be accompanied by a parent or an older sibling. You can apply to become a full member (if not already a member) and join a Saturday morning training session with paddlers of similar ability to improve your paddling skills. For more information contact our training coaches. Alternatively, come to the Club on Saturday mornings between 10.30 and 11am and speak to them to discuss any queries you may have. If you want to find out more about the types of flatwater racing that we do, get in touch today.